Sladers Yard is pleased to hold stock of Daisy Cook’s work. Please do let us know if you would like to make an appointment to view her paintings here. Daisy Cook works in layers, abrading and paring back the surfaces to reveal or partly reveal what is behind, giving a remarkable sense of depth and of time. Subtle in their lines and character, her calm potent paintings dwell in the mind. ‘Daisy Cook’s new work… evokes the previous histories of a landscape, the ghosts of presences and alignments long gone but still discernible. The thin liquid paint, with its runs and drips, suggests rather than states, while her colour evokes a complexity of mood that is almost archaeological in its analysis of varying traces.’ Andrew Lambirth, art critic. Daisy Cook and her sister Lucy were Peter Cook’s only children from his first marriage to Wendy Snowden. It was his death in 1995 when he was only 57 which motivated Daisy to become a full-time artist and do what she had always wanted to do. Her first show in London was virtually a sell-out and since then she has painted professionally and shown regularly in London at the Northcote Gallery, in USA and in good galleries around the UK. 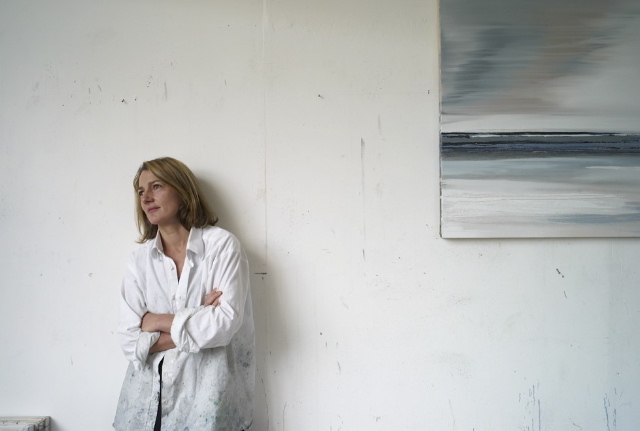 Her work is in a number of corporate collections including a commission for the Bank of England as well as those of celebrities including Julianna Marguilles, Geraldine James, Rory Bremner and Terence Conran. Her work has been reviewed in numerous journals and newspapers including Art Review. ‘Land, sea and sky: those three great elements of our dwelling and of our visual experience, are evoked in Daisy Cook’s work; their interactions patiently witnessed, watched during their processes of transformation. It is good to spend time in the company of these works: they have a particular way of disclosing themselves while light changes, blooms and fades… There is a sense of what some might call the ‘mystical’ which is never alluded to in a heavy-handed or literal way: it is simply the life that the light discloses and which in turn initiates change.’ Elizabeth Cook, poet, extracted from her foreword to the catalogue for Daisy Cook’s Sladers Yard exhibition in 2015. Daisy Cook’s paintings are displayed below. Hover your mouse over an image to see details about it or click on any image to expand the pictures and see them with captions. Please email gallery@sladersyard.co.uk or phone 01308 459511 if you would like to enquire about Daisy Cook’s paintings. Paintings are available to buy or reserve now.